Who wore it best? The fashion blogger’s perennial question shouldn’t apply to clothing in a work of art. But Suzy Lake seems to invite comparison between her new photo piece, Performing Haute Couture No. 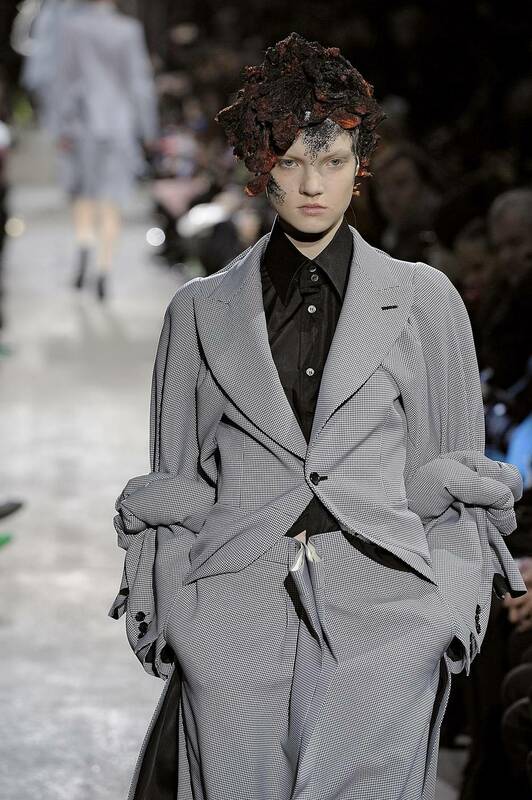 1, and an image of a model wearing the same Rei Kawakubo suit in Comme des Garçons’ fall 2013 ready-to-wear show. 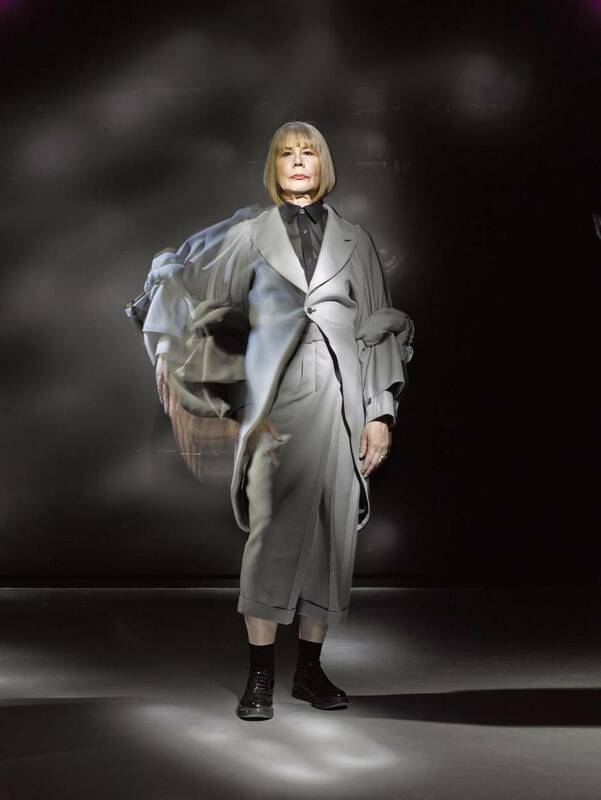 "I felt that it would be very cheeky for an older woman to model in the manner of all these young fashionistas," says Lake. You could say that runway models also “perform” their outfits, in that they strut, pose and wheel in very codified ways. The CdesG model defines something about Kawakubo’s playfully retro design by jamming both hands in the pockets of the high-water pants. The white sneakers – marching between rows of expensive dress shoes – reinforce the designer’s insouciant take on her source: the formal morning suit still worn at posh weddings. Lake says she wanted an “architectural” outfit, capable of supporting “a movement that would animate the clothes.” Fashion photographer Miguel Jacob’s slow shutter captures that motion as a blur of the arm that paradoxically helps to monumentalize Lake’s stolid pose. The upward camera angle emphasizes the authority of her gaze, and the crossways hitch of the trousers, framed almost symmetrically by the coat’s cutaway front, exaggerates the turn of the hips. It’s a classic warrior pose, adopted in countless military portraits of two centuries ago. The artist regards us like an unbowed veteran of a long and difficult campaign. That may be a fair summary of Lake’s four-decade career. Her early performance-based photography played a key role in imaging the social construction – or deformation – of the female self. To confront the 88 large self-portraits of her 1979 series Are You Talking to Me? is to be overwhelmed by a storm of uneasy narratives. The anxieties projected by her face – torqued in some images by heating and stretching the negatives – evoke the coercive social powers operating outside the frame. The film-still qualities of those portraits – a response to Robert De Niro’s famous monologue in Taxi Driver – can’t help but recall the work of Cindy Sherman, Lake’s younger and more famous colleague. But Lake’s project is more humane, and ultimately more optimistic. The sheer quantity of images in Are You Talking to Me? hints at the ability to endure the long dance of imposed identity, and perhaps to overcome it. You can see the same kind of movement toward autonomy by looking at On Stage, a 1972 slide show of street fashion poses, and then considering the recent Extended Breathing series, in which the artist tries to hold a standing position for an hour. The On Stage photos are all about pouring oneself into a pre-existing mould. “Are our ‘self’ projections an act of concealment?” asks one text between images. In Extended Breathing, every part of Lake’s body is blurred slightly, except for the feet. Like the settings of these static performances – which include the World Trade Center and her own backyard – Lake’s feet are firmly in focus, grounding her on the earth. In Beauty at a Proper Distance/ In Song, a photo triptych from 2002, Lake’s sharp colour close-ups of her own mouth and jaw reveal wrinkles, blemishes and isolated whiskers on the chin. “My catchphrase was, ‘I can do anything Britney Spears can, plus I can grow facial hair,’” she says, deflecting the body shame that women of a certain age are expected to feel. That’s the proper context for Performing Haute Couture No. 1. As in On Stage, Lake puts on the fashionable togs in order to test her power to resist the system of appearances they represent. But this time, she doesn’t disappear into that system. The clothes don’t wear the girl, as another stock fashion comment would have it. The woman gets dressed and remains who she is. No one can wear anything better than that. Introducing Suzy Lake is at Toronto’s Art Gallery of Ontario through March 22. Lake delivers a public lecture on Nov. 12 at 5:30 p.m. in the AGO’s Jackman Hall.